If you’re getting divorced, charged with a criminal offense or filing a lawsuit, you need an attorney. And if you’re the law firm of Wesley Clark & Bates, you’re open for business on all counts. “It’s one-stop shopping,” Sarah Wesley says. The LLP has been four years in the making. Wesley, a Livonia native, started Wesley Law four years ago. She added attorney Kevin Clark last year, and Penfield graduate Alison Bates came aboard this past February, tacking another name onto the partnership with offices at 45 Exchange Blvd. in downtown Rochester. What makes this law practice different from many others? Diversity. Wesley, 35, grew up in Livonia the daughter of a federal judge and a kindergarten teacher. She went to Cornell as an undergraduate and the University at Buffalo for law school. After spending a few years practicing law in New York City, she returned to Rochester and worked in the district attorney’s office for two years before opening her own practice. The Rochester resident’s specialties are criminal defense and civil litigation, and she’s developed quite a reputation along the way. “She’s famous for getting hung juries,” Bates says. It’s a true story: Wesley has served as a defense attorney for seven violent trials over the past three years, and six resulted in hung juries. Clark, 42, grew up in Nebraska and graduated from the University of Nebraska. He spent years working in census polling for Gallup before returning to law school. He married a Penfield High graduate, moved to Rochester and worked in the DA’s office in 2008. He has become the business manager for Wesley Clark & Bates, doing all of the bookkeeping. The Penfield resident specializes in criminal defense but has been shifting into the personal injuries sphere. Bates, 33, studied child psychology at the University of Albany and fully expected to be a teacher. She took her LSATs late in her college career and eventually went to Albany Law School. 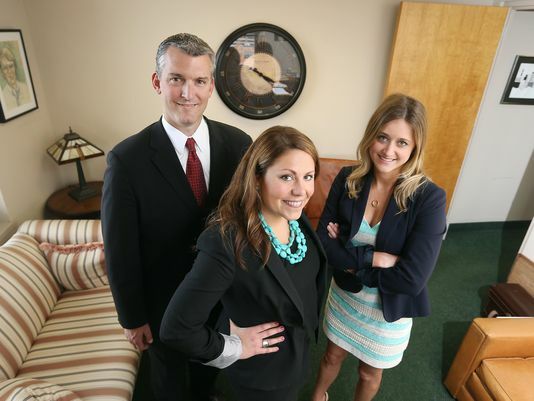 The Perinton resident started her own practice, specializing in divorce and custody cases. She eventually became a family court clerk, in large part out of necessity. When Wesley and Bates were solo practitioners, they often would send each other clients. They’d also see each other in the court house and commiserate about the challenges of running their own practice. “We both thought it would be nice to have someone to back us up,” Bates says. The three are equal partners and already have run the gamut of court cases: estate work, civil litigation, a divorce … and Wesley has a murder trial coming up.